Doka sea strainer 1in - 1-1/4i Size: 1" x 1-1/4".. Cast bronze with nut. Base: 2-3/4" x 3-3/4"Stem: 2-1/2"Pipe: 1".. Cast bronze with nut. Base: 3-7/8" x 5-3/4"Stem: 3"Pipe: 1-1/4".. Cast bronze with nut. Base: 3-7/8" x 5-3/4"Stem: 3-1/2"Pipe: 1-1/2".. Cast bronze with nut. Base: 2-3/4" x 3-3/4"Stem: 2-1/2"Pipe: 3/4".. Cast bronze with slide out removable screens. Size: 12-3/4" L x 5-7/8" W x 2-1/8" HScreen: BronzeMax.. Cast bronze with slide out removable screens. Size: 10-5/16" L x 4-5/8" W x 1-3/4" HScreen: BronzeMa.. Cast bronze with slide out removable screens. Size: 13-15/16" L x 7-1/16" W x 2-3/16" HScreen: Stain.. Cast bronze. Size: 3-1/2" dia.Max. Thru-Hull: 3/4".. Cast bronze. Size: 4" dia.Max. Thru-Hull: 1".. Cast bronze. Size: 5" dia.Max. Thru-Hull: 1-1/2".. Cast bronze. Hose: 1-1/4" x 1-1/2" x 3/4" NPT.. Cast bronze with slide out removable screens. Size: 6-5/8" L x 3-3/4" W x 1-1/16" HScreen: Stainless..
One piece cast bronze fitting with nut. Made in U.S.A. Size: 1"..
One piece cast bronze fitting with nut. Made in U.S.A. Size: 1-1/4"..
One piece cast bronze fitting with nut. Made in U.S.A. 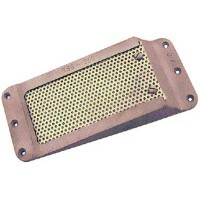 Size: 3/4"..
Fine 40 mesh stainless steel filter screen prevents breakdowns from particles in the water. Transpar..
Service kits for ARG strainers. Contain cap O-ring, sight glass O-ring, washer and drain wingnut gas.. Bronze. Mount the ring permanently. Fasten the strainer to the ring and remove as often as needed. S.. Bronze Size: 8-1/2" x 6"Fastener: 6-#10Max Thru Hull: 2-1/2".. 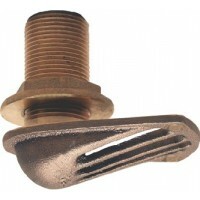 Bronze Size: 5-1/4" x 3-5/8"Fastener: 6-#10Max Thru Hull: 1"..
Includes locking nut. 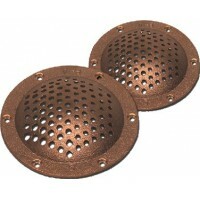 Size: 1"Strainer: 1.05"Thread: 2.85"..
Standard single strainers. No tie rods or leaks under pressure or vacuum. Quick and easy mounting sy..
Includes locking nut. Size: 1-1/2"Strainer: 1.30"Thread: 3.15"..
Includes locking nut. Size: 1-1/4"Strainer: 1.20"Thread: 2.90"..
Includes locking nut. Size: 1/2"Strainer: 1.05"Thread: 2.20"..
Includes locking nut. Size: 2"Strainer: 1.50"Thread: 3.60"..
Includes locking nut. Size: 3/4"Strainer: 1.05"Thread: 2.20"..
Polyethylene basket for arg750 Fits: ARG750Screen: PolyethyleneLength: 6"..
#304 ss filter basket 1/2in Fits: ARG500Screen: 304 S.S.Length: 4"..
#304 s/s filter basket Fits: ARG750Screen: 304 S.S.Length: 6"..
#304 ss filter basket 1in Fits: ARG1000Screen: 304 S.S.Length: 5.88"..
#304 ss filter basket 1-1/4in Fits: ARG1250Screen: 304 S.S.Length: 7.875"..
#304 ss basket for arg2000s Fits: ARG2000Screen: 304 S.S.Length: 9.75"..
Ss basket for arg3000 Fits: ARG3000Screen: 304 S.S.Length: 11.88"..
Access to the thru-hull fitting and seacock beneath the hull strainer is made easy with the patented..
For the ARG series strainers. Maximum psi is 100. Maximum temperature is 225° F. Sight glass include.. Protect fresh water pumps from debris. White nylon strainer head and clear plastic sight glass. Glas..
For SA series single strainers. Contains wingnut washer, nut cover gasket and cylinder gasket. Fits:.. Bronze. With mounting ring. Easy access to the thru-hull fitting and seacock beneath Groco hull stra.. Bronze Size: 6-13/16" x 4-11/16"Fastener: 6-#10Max Thru Hull: 1-1/2"..
For the SA and VD series strainers. Size: 3" x 11-7/8"Fits: SA-2500 & VD-2500..